We did get some rain mixed with snow yesterday. The plows were out early. The snow stuck in the grass but overall the roads stayed fine and a few people were out fishing. Hopefully the last of that is behind us . The air temp should reach 55 degrees today with a mostly cloudy sky. The wind should peak around 9 mph. 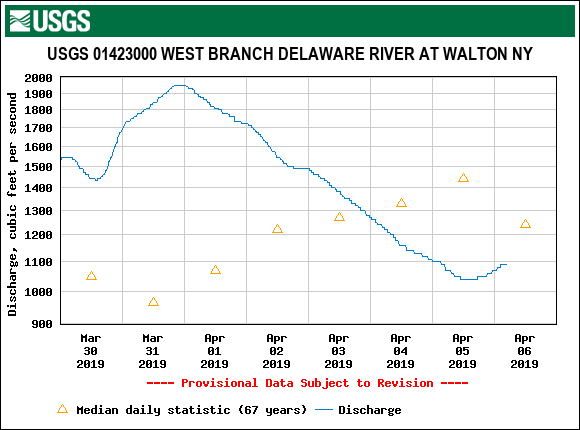 The West Branch look good this morning and the flow of 1,110 cfs at Hale Eddy looks steady on the graph. The rest of the rivers are dropping slowly as the runoff slowly subsides.It may take the rivers a while to warm up but it seems like a great day to be on the water. Nymphs and streamers to start off the day. Keep a lookout for risers in the afternoon once the water temps begin to climb. We’ve seen enough surface activity to keep it interesting but the wind has been tough to deal with so far this Spring.